Sequoia National Park officials say this is the first time they’ve seen clusters of baby giant sequoias sprout together. 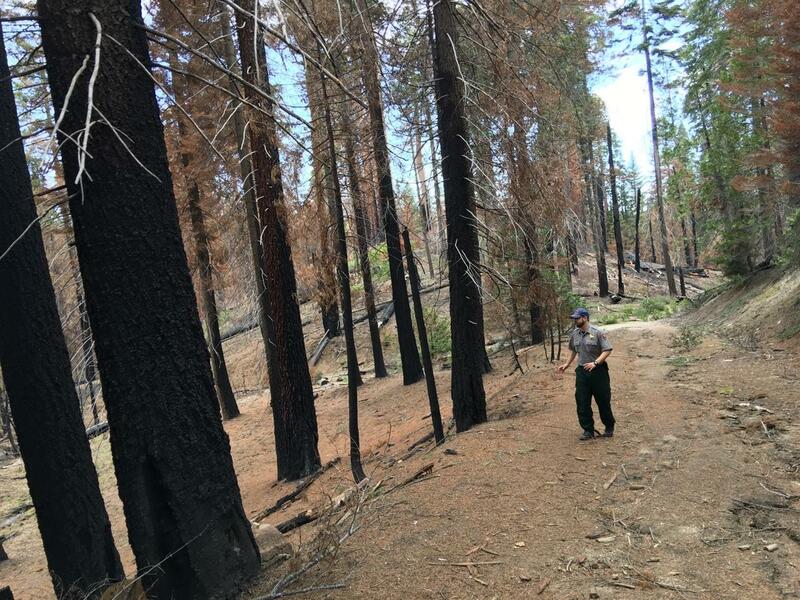 The Rough Fire tore through 8,888 aces of giant sequoia groves. The fire effects within the sequoia groves is mostly positive. 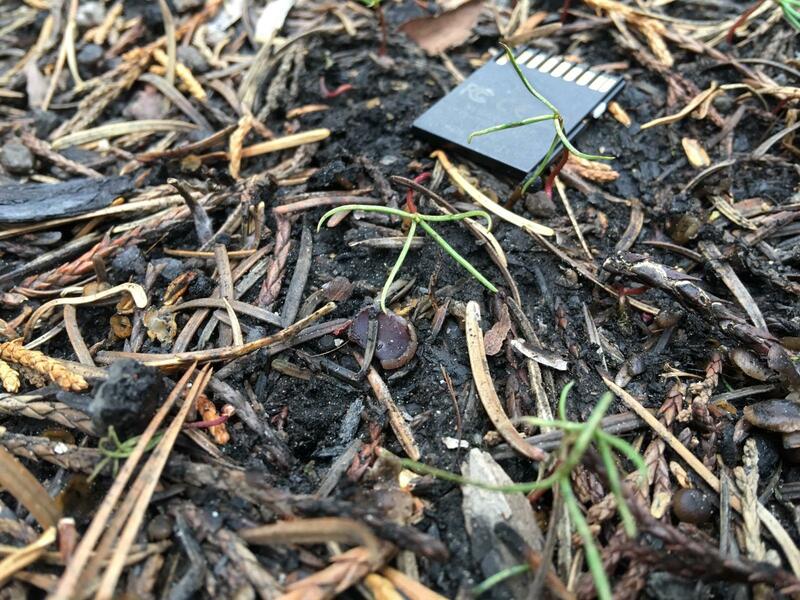 Fire plays an important role for giant sequoia regeneration. The lightning sparked Rough Fire burned last year for more than five months consuming over 150,000 acres of forest in the Sierra Nevada. Now after a wet winter the charred forest is slowly coming back to life. And the first signs of growth are the tiniest of seedlings that’ll become the world’s largest trees. In 2015 the Rough Fire in the mountains east of Fresno grew so large that it threatened 12 different giant sequoia groves. Unlike the millions of pine and fir trees that were decimated by the blaze, giant sequoia trees weren’t taken out altogether. 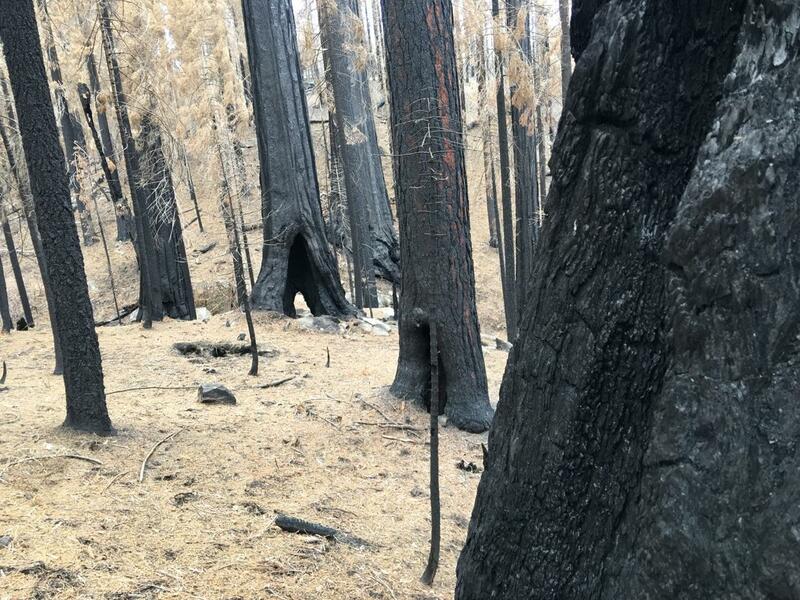 Instead the Rough Fire actually helped these trees. 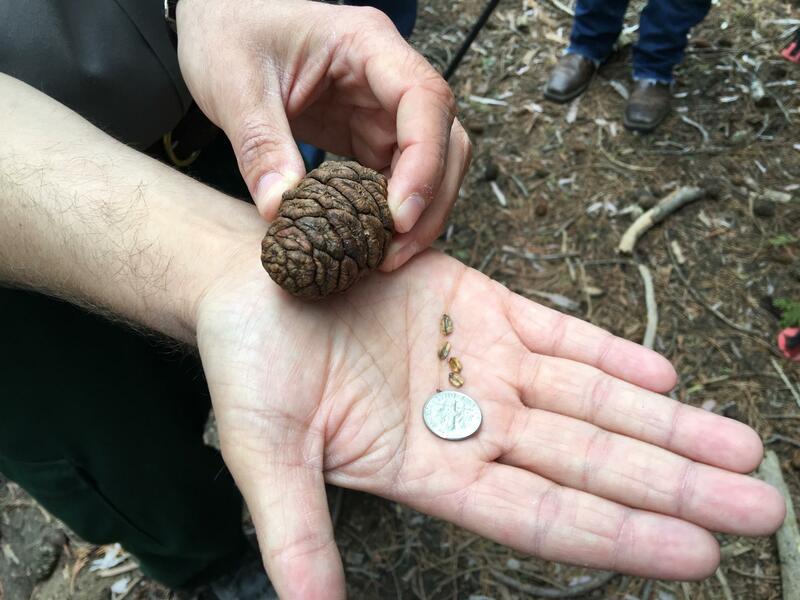 Giant Sequoia seeds are mainly released from their cones when fire burns them. As the Rough Fire crept through these groves Caprio says the fire burned the cones unleashing oatmeal like seeds into the now fertile soil. Caprio, a few other scientists and I are hiking the one-and-a-half mile North Grove trail in Grant Grove. Caprio says many giant sequoias withstood the Rough Fire because the Park Service used prescribed burns to decrease the chance of high intensity blazes. The other reason is the tree’s fibrous bark. In this area of the park prescribed burns halted the spread of the Rough Fire towards Grant Grove. A little farther down the trail there’s a clear delineation of how prescribed burns can help preserve the landscape. National Park Service Fire Information Officer Mike Theune points to an area west of the trail where everything is charred. This area not too far from the famous General Grant Tree was never intentionally burned to reduce the hazards of wildfire. The Rough Fire charred over 150,000 acres of forest in the Sierra Nevada. When the fire approached this previously treated area the blaze slowed down preventing damage to the core of Grant Grove. But despite how dead and scorched this area looks today at our feet are signs of the forest ready to regenerate itself. All those seeds the fire unlocked are beginning to sprout. He also says so many seeds have germinated that clusters of seedlings are growing up together, which he says usually doesn’t happen. By next year Theune and Caprio expect the seedlings to be joined by ferns and other plants. Each living giant sequoia tree released thousands if not millions of seeds when the Rough Fire burned through the groves. He says a prescribed burn a few years ago in another giant sequoia grove taught them how important fire is in thinning out young seedlings. They also hope to apply those lessons to this grove so in a thousand years these little seedlings could be some of the largest trees in the world. A hard to reach grove of giant sequoias in Tulare County is going to get a lot easier to get to later this year. The trees sit on top of a mountain seven miles southeast of Three Rivers that's part of Craig Ranch. The ranch was given to the Bureau of Land Management through a deal between the Visalia Sequoia Riverlands Trust and the San Francisco based Save the Redwoods League. Jessica Neff is with the league. Is The Drought Killing The Giant Sequoias? The Giant Sequoias in the Sierra Nevada are one of America’s treasures. But for the first time in the parks history the trees are showing visible signs of exhaustion due to the drought: thin and browning leaves. Valley Public Radio’s Ezra David Romero hikes into one of the largest groves of Giant Sequoias and finds a crew of scientists rushing to gather data by scaling the monstrous trees. Anthony Ambrose is on the hunt in the Giant Forest in Sequoia National Park, but not for deer or wild boar. The drought in California has killed millions of trees in the Southern Sierra Nevada. But the problem is more widespread. As Amy Quinton reports from Sacramento, some ecologists say the state could lose some of its iconic trees. A US Forest Service aerial survey in April found 20 percent of the trees in a 4.1 million acre area in the Southern Sierra were dead. Jeff Moore conducts those surveys.